The family-run Lürssen company can today look back at over 140 years of shipbuilding history. Within just four generations, the Bremen-based Lürßen family has turned a small boat building workshop into a world-class North German shipbuilding company through entrepreneurship, determination and the highest standards of quality. The secret of their success is in their profound trust in their staff, their great drive to innovate and their trademark product quality. On 27 June 1875, twenty-four-year-old boat builder Friedrich Lürßen laid the foundation stone for the family-run company, which is today among the world’s leading yacht manufacturers with over 1,000 highly qualified staff at its Bremen site and among Europe’s most renowned systems and equipment traders for new naval ship construction. 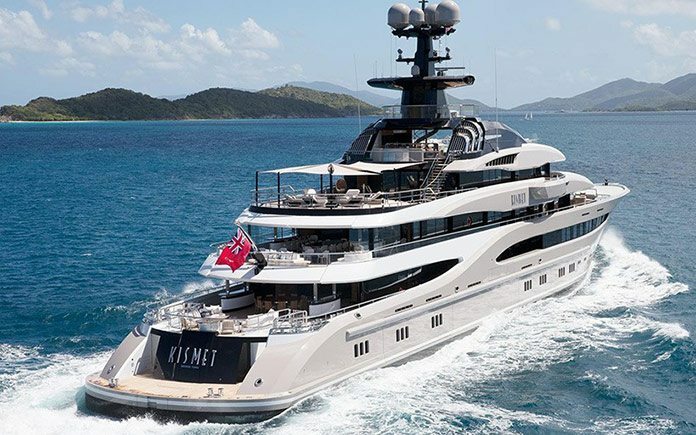 Since then, the Lürssen shipyard has manufactured more than 13,000 boats and ships – all at the Bremen shipyards or their North German sister shipyards that are currently included in the Lürssen group. In the early years, the Vegesack-based boat builder initially focused on building smaller, more maneuverable boats. In the 1880s, the shipyard became the focus of public attention for the first time when it built the REMS Daimler boat – one of the first three motorboats in the world. A few years later, the company had already become one of Germany’s leading motorboat manufacturers. Under the direction of Friedrich’s son, Otto Lürßen, the shipyard developed into an innovative manufacturer of prize-winning speedboats, including the LÜRSSEN-DAIMLER – christened in 1911 – a 102 PS petrol-driven boat that won the Côte d’Azur prize and the Grand Prix de Nation. Another sensation of the age was the SAURER-LÜRSSEN speedboat, in which a speed record of 30 knots was made and the unofficial world championship – the Prix de Monte Carlo – was won. Some years later, the shipyard manufactured its first cruisers for the US market and began developing speedboats for the Navy, the construction of which was continued from the 1950s onwards under the management of Gert and Fritz-Otto Lürßen. The manufacture of highly technical coastal patrol boats and speedboats, auxiliary and servicing ships, anti-mine boats and offshore patrol boats, as well as corvettes and frigates for the German Navy and for export, is still core business for the Lürssen shipyard. At the end of the 1980s, the current owners Friedrich and Peter Lürßen took the decision to intensify the construction and manufacture of individual luxury yachts, establishing it as a second business activity alongside naval shipbuilding. This has proven to be a success. Today, 25 of the Top 100 yachts have been built by Lürssen (8 of the Top 20) – including such milestones in the shipbuilding industry as Carinthia VII, the sailing yacht EOS, and AZZAM – currently the longest private yacht in the world at 180 m.